Buy Any 2 SUPs, Save $200 and get Free Shipping. Use Coupon Code "BUDDY200"
Save $80 on any SUP and get Free Shipping. Use Coupon Code "PADDLE ON"
If there's one thing we do well at Soulr, it's hand crafting surfboards and stand up paddle boards which offer a unique blend of performance, strength and durability. Our surfboards are purpose-built to handle a variety of wave shapes, conditions and personal style. Whether you're just getting started or you're a seasoned surfer looking to try something new, we've got a surfboard or SUP that will perfectly compliment your abilities and help you progress to the next level. Best board I've ever owned. Love my 11'0 Bamboo SUP. Can't seem to stay off the water. Started off small with just a few quick paddles, but now I'm burning through 3-4 miles almost every afternoon. Thanks again for a great board. So far we've taken them down to Mexico (Gonzaga Bay...not the paddle board heaven we thought it would be) and had them out Sat and Sun at La Jolla shores, which was really amazing. We've gotten complements on our boards from literally every paddle boarder that we came across this past weekend. I was looking for a board slightly larger but versatile. Basically, a board that can do it all in most conditions. The 6'8 SoulR hybrid is exactly that. Its super functional in big waves and has the speed necessary for small mushy waves. I love how much float this board has while the narrow swallow tail allows for great turns. My experience with Soulr has been stellar. The "Bottlenose" surfboard has the stability for beginners without feeling like a beginner board. Where most boards sacrifice some features for others, this board is an all around perfect balance of float and shredibility! Time to build a bigger board rack, stoked! 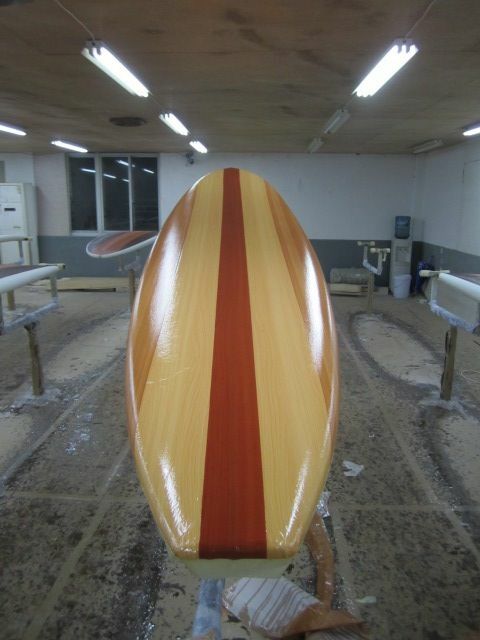 We believe surfboard shapers are what makes this sport special. That's why every board we make is hand shaped from start to finish. It helps keeps the soul in surfing. There's a lot of effort that goes into making our surfboards & SUP's. Every material we use was carefully selected to maximize performance and strength. We use advanced vacuum-bagging techniques when curing the resins of every board. We are also one of the few companies that utilize carbon fiber extensively in our performance shortboard line. This space age material is incredibly strong, flexible and durable. When running a business, it's easy to forget your obligations to the commonwealth. At Soulr, we recognize the importance of social responsibilty. That's why we use eco-friendly foam blanks, where every scrap and shaving from our XPS boards is recycled to make new EPS and XPS blanks. Our office is 95% paperless. Even the web hosting company we use to power this website is carbon-neutral. All these little things add up, which helps keep our planet healthy and our oceans clean. It's our customers that make us great, so if you're not happy, we're not happy. Order with confidence: you can get any board you want, wax it up and take it for a test drive at your local break. If you don't like it, return it within 30 days. Just use Bill Me Later at checkout to get no payments and no interest on your entire purchase if paid in full in 6-months. Stoked!